The Supreme Court Friday asked the Election Commission to respond to two pleas seeking an independent review of the software used in Electronic Voting Machines (EVMs), Voter Verifiable Paper Audit Trail (VVPAT) and EVM Tracking Software (ETS). A bench comprising Chief Justice Ranjan Gogoi and Justice Sanjiv Khanna asked the poll panel to file its response by March 1 to the PILs which have also suggested changes in the source code of EVMs to make them tamper proof and would prevent a “pre-determined outcome” during elections. The PILs have been filed by activists Sunil Ahya and Ramesh Bellamkonda respectively. They have sought software review of EVMs, VVPAT and ETS, particularly their source code, the fundamental component of these machines. A source code is the brain of an electronic machine which instructs its hardware on how to function. “We would require to hear the Election Commission of India (EC) on the statements made in the writ petitions and reliefs prayed therein. The petitioners in both the cases to file additional paper books in the Registry. “The Registry to ensure that copies of the writ petitions are made available to the Secretary” of EC to to enable it to take a considered view in the hearing which will be held on 1st March, 2019, the bench said. Besides the poll panel, Ahya, in his PIL, has made the Electronic Corporation of India Ltd and the Bharat Electronics Ltd as parties. He has sought registering of the source codes used in EVMs, VVPATs and ETS with an appropriate public authority, so that it can be referred to on election day to confirm that the audited version of the software was being used. The plea said that not conducting a software review of EVMs, VVPATs and ETS used in elections, “infringes” the freedom of expression of citizens and affects their democratic rights which is a “cause of concern for national security”. 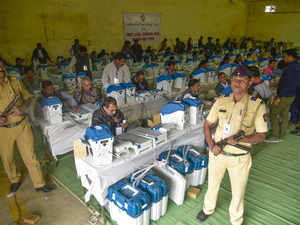 It said that a software review of EVMs was necessary as the EC was mandated to verify VVPAT paper slips of only one polling station per assembly constituency, whereas an election result, was arrived at by counting of votes casted at all the polling stations in a constituency, which can ultimately be ascertained only by means of EVMs. “The source code of EVM, VVPAT and ETS, all in concert, play a very important role in the scheme of conduct of elections. And, if these source code of all these devices were to be subverted in concert, then the process of randomization process would no longer maintain its randomness, rather it will become deterministic and systematic. This would be able to achieve a pre-determined outcome of the election process,” said the plea filed by Ahya.